Living with diabetes and food intolerance can present a challenge. 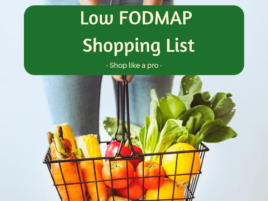 Not only do you need to worry about which foods are best for managing your long term health, but now you need to know which ones are also low FODMAP and won’t leave you running to the bathroom. This is the first of a two part blog. Today we will discuss the relationship between diabetes and IBS. In part two we will discuss eating strategies for combining Diabetes and a low FODMAP diet. Carbohydrate foods are the best energy source for our body. When we eat foods containing carbohydrates they are absorbed from the digestive tract and into the blood stream as glucose. This increases blood glucose levels. The pancreas keeps a tight watch on blood glucose levels, and when it sees them rise, special cells make and release insulin into the blood stream. The insulin then aids the glucose to move from the blood stream into the body cell where it can be used for energy. FODMAPs are not absorbed properly in the small bowel. This means that they continue their path along the digestive tract to the colon. FODMAPs draw water into the bowel as they travel, which may cause diarrhoea, bloating and pain. Glucose is not a FODMAP, it is easily absorbed with other nutrients in the human digestive tract. ​Type 1 diabetes is an auto immune condition where the cells in the pancreas that produce insulin are attacked and destroyed by the body’s immune system. When the body can no longer produce enough insulin, the glucose cannot leave the blood stream. The blood glucose remains high (hyperglycaemia) and can cause damage to body systems including blood vessel and nerve damage, kidney disease, and heart disease. Type 2 diabetes is a little different. The pancreas still makes insulin, but either not enough or the cells in the body are “resistant” to the insulin. This is called Insulin Resistance and also results in chronically high levels of glucose in the blood, or Hyperglycemia, resulting in similar symptoms and complications to type 1 diabetes. Testing for diabetes involves a simple blood test after a period of fasting. The best person to discuss this with is your doctor. Managing diabetes usually involves a combination of medication, diet and lifestyle changes. It’s important for people who have diabetes to be able to recognise the types of foods that contain carbohydrates and make sure to spread their intake of these evenly over the day. This will help energy levels and blood glucose levels remain more stable over the day and prevent putting too much stress on the pancreas. An easy way to do this is to talk to your dietitian about learning to “carb count”. If you require insulin or certain diabetes medications to manage your diabetes, you will also need to monitor your blood glucose levels throughout the day and respond to them with insulin injections to prevent blood glucose levels going too high (hyperglycaemia) or too low (hypoglycaemia). You may need to eat between-meal low FODMAP carbohydrate snacks. Discuss this with your dietitian. Gastroparesis: bloating, reflux, vomiting, pain/cramping, altered blood glucose levels, lack of appetite. Although symptoms of these conditions may be similar to IBS, they are caused by a different mechanism. A low FODMAP diet does not address the mechanism that triggers symptoms in these conditions. A low FODMAP diet is unlikely to help and is currently not recommended or evidenced to manage gastroparesis or dumping syndrome. Type 1 diabetes and coeliac disease are both auto-immune conditions. Coeliac disease is a condition where the body reacts abnormally to the protein gluten, resulting in damage to the lining of the small bowel. This damage affects the body’s ability to absorb nutrients properly and if left untreated, coeliac disease has serious consequences. Some people don’t have any symptoms at all, while others can experience symptoms similar to IBS. There is a higher incidence of coeliac disease in people who have type 1 diabetes and medical guidelines recommend that people with type 1 diabetes are screened for coeliac disease. NB: Gluten is a the protein in wheat and FODMAPs are the carbohydrate in wheat. Although they are present in similar foods, they are not the same molecule. You can read more about the differences between gluten and FODMAPs here and my experience with being tested for coeliac disease here. Your health care team including your doctor, endocrinologist and dietitian are best place to determine if your symptoms are resulting from either of these conditions and the best way to manage your situation. If you have been diagnosed with diabetes and have IBS, it is recommended that you see a specialist dietitian for specific advice and guidance about developing an eating plan that’s right for you. Be sure to check out the second part of this article “Eating for Diabetes & IBS – Part 2” here.